All Idler sprockets come complete with a fitted ball bearing. The ball bearings are sealed on both sides and thus maintenance-free. They are lubricated for life. The wide inner ring allows an easy assembly without spacers. The ball bearing and sprocket are permanently joined by press-fit. 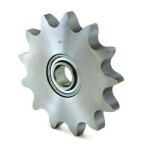 The sprocket is made of steel with a strength of 490 – 600 N/mm². The design of many chain drives requires a tensioning wheel. A chain tensioning wheel is ideal for solving tensioning problems if fitted on the slack side of the chain drive.